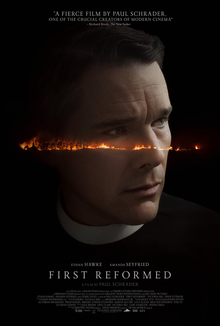 Imagine two houses of worship with the names First Reformed and Abundant Life. It’s a little like the old Jerusalem and Rome dichotomy as the two impulses might manifest themselves in the Protestant church. Those are the spiritual homes that Paul Schrader employs as props in his latest movie. Ethan Hawke plays Reverend Toller, the troubled leader of a 250 year-old ministry that had once been a stop on the underground railway, but whose pews are now empty. One of the film’s central themes is isolation. Schrader frames his shots emphasizing the narrowness of the church, the single bed in which his minister sleeps and the solitary desk at which he writes. The absence of furnishings resonate the spiritual void and the feeling of isolation is underscored by Hawke’s interior monologue. As if to add insult to injury, Toller finds himself nursing souls which cannot be healed—one of which is an environmentalist, out to destroy the very thing he seeks to preserve—human life. “This is about your despair, your lack of hope, the sickness unto death,” he says invoking Kierkegaard. Unfortunately, he’s not preaching to the choir; even he himself is not convinced. Schrader is a famous student of his own medium and early in his career wrote Transcendental Style in Film. Bresson was one of the directors he dealt with and there may be a tendency to compare the film to the French director’s iconic Diary of a Country Priest particularly due to the journaling and the feeling of constriction that define the film. But there are also intimations of Bergman’s Winter Light, the first in a spiritual trilogy which included The Silence and Through a Glass Darkly, particularly in an outburst in which Toller tells Esther (Victoria Hall), an Abundant Life staffer who loves him, that he “despises” her. Eventually, by the way, Toller is saved by a character named Mary (Amanda Seyfried) who’s hardly a virgin.